Steve Oualline talks about C code optimization on his book: Practical C Programming. I was curious about the real performance gains. The benchmark test results are at the end of the post. How can this C code be optimized? The most tricky to understand is changing Y_SIZE from 30 to 32. This will activate one feature of most C compilers that converts multiples by a power of 2 (2, 4, 8, ...) into shifts. This will result in performance gains when the computer is doing pointer arithmetic to access the correspondent memory address of matrix[x][y]. The compiler will change one multiplication operation into one shift operation which is cheaper. Reducing the number of loops and taking control of the pointer arithmetic is great performance optimization. 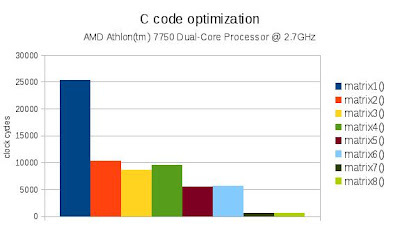 Looks like that there is nothing more to optimize. You can always write some assembly but it may not be good idea. The library function memset() can be used to fill a matrix. "Frequent used library subroutines like memset are often coded into assembly language and may make use of special processor-dependent tricks to do the job faster than could be done in C". There is overhead in function call. It is possible to do better with macros. 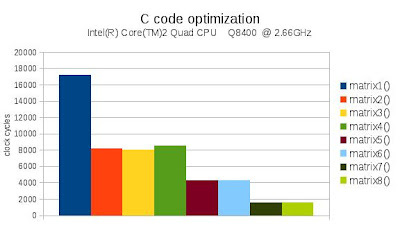 The improvements looks good, but how much efficient each optimizations are? I've measured it in clock cycles. And found that the optimization level is processor dependent. For clock cycles, lower is better. So, it is real! 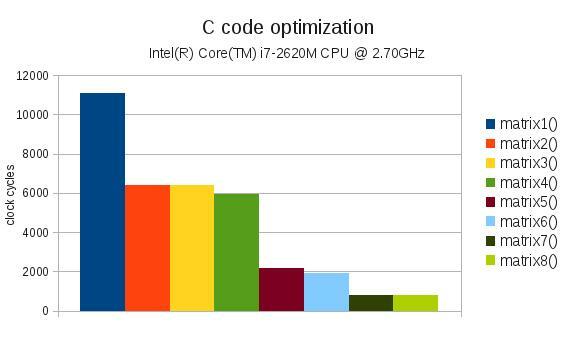 For Intel you can get 2 times faster performance by doing simple changes and not using pointer arithmetic. If you do take control of pointer arithmetic and trash some variables, the performance gain can go up to almost 6 times faster. The performance gain can reach 14 times faster by using ultra specialized subroutines. It is much better then I was expecting. For AMD the use of the specialized functions can result in speedup of more than 40 times. The clock cycle count is not an integer because the values shown are average mean of 256 measurements. For the graphs that shows results in clock cycles, lower is better. How to recompile software with hardware optimization? This may be useful for compiling local applications that you want to run faster.